Not long into Tony Johnston's fierce little tome Bone By Bone it becomes clear that ghosts are being laid to rest. In fact, you can fair hear the scrape of the nail against the wood grain. As Johnston writes in the novella's introduction, her otherwise happy upbringing was soured by the unforgivable — a parent's xenophobia. She describes herself as 'haunted by my father'. Bone by Bone isn't strictly autobiographical, however. It may be set in the 1950s, the era of Johnston's childhood, and in Tennessee where her father was born and raised, but this appears to be a shoring up of context rather than sentiment. Consolidating this, Johnston has a nine-year-old boy walk in her shoes. In the manner of childhood friendships the two soon become inseparable. Not only are they a similar age, they share in a lively imagination as well as a passion for baseball. Both, too, can name each bone of the human body, thanks to the auxiliary third member of their gang — Fats— a 'birth' gift from David's father, a doctor. My Mama newly dead, that fatherly gesture must have cost him. But maybe Daddy didn't link them, Mama and the skeleton. As David's friendship with Malcolm intensifies, and each drop of injustice congeals around them like a toxic puddle, it becomes more and more difficult for him to reconcile the father who patiently, lovingly, unravels the mysteries of each human bone, with the man whose hatred is skin deep. It's unfortunate, and distracting, that Bone By Bone treads what appears to be all-too familiar territory. In David's tale of discovery and loss it's near impossible not to be reminded by the US classic To Kill a Mockingbird, but to dismiss the novella as a poor imitation is to sell it undeniably short. Having written more than 80 books in a career that's spanned some 40 years, Johnston is one of America's finest and most prolific children's novelists (Bone is her first crossover book). Little wonder then that each passage comes to the page brimming with confidence. It's as if the very act of conjuring words out of thin air is, for Johnston, as rudimentary as popping up to the shops for a litre of milk. Despite the novel's confessional origins there's little evidence of the self-indulgent or self-serving. 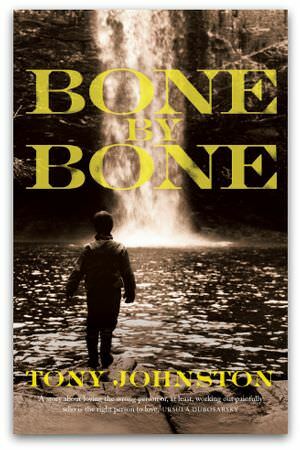 Instead, as Australian author Ursula Dubosarsky points out, Bone By Bone is about 'loving the wrong person or, at least, working out painfully who is the right person to love' — a timeless message that transcends genres and bestows upon the term 'bound by blood' a profound, disquieting meaning. Jen Vuk is a freelance writer. She works as a staff writer for the Salvation Army's magazine Warcry. During the 1970s, Australian cinema experienced what many now regard as its golden age. Who were the maverick filmmakers gleefully scuffing up the flipside of that glittering coin, and why does Phillip Adams despise them so? What is Germaine to her personality? .. Her Catholic childhood I fear.